Hoover the cat, proud owner of Dennis and Jen Wijnker in California, may not have been planning on adopting any more humans into his fold -- but he seems very accepting of the family's one-year-old Hazel. 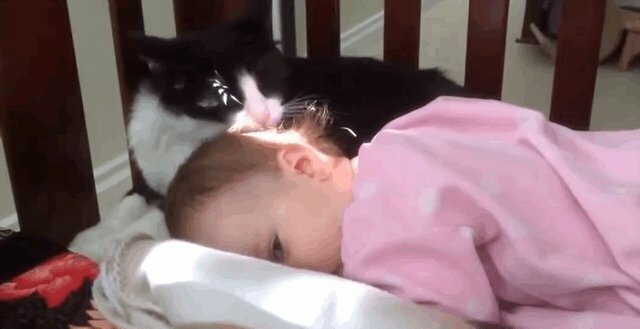 Jen recently uploaded video of Hoover giving her baby a tongue-bath, grooming her just as he might a kitten. "Here is our sweet cat Hoover giving one-year-old Hazel an affectionate cleaning," writes Jen. Cats are meticulously clean, spending about half their day keeping their own fur tidy. But when licking is directed at humans, it's nearly always a sign of fondness and affection, not to help with our hygiene. But as Laura Moss from MNN points out, a licking cat might just appreciate the taste of your shampoo. You can never tell with cats.